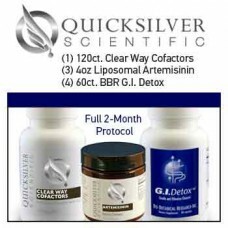 1 x Clear Way Cofactor (120 Caps)3 x 4oz Liposomal Artemisinin4 x BBR G.I. Detox (60 Caps)This BOX s.. The Liver Detox Box contains:- "Pure PC," 2 bottles; 4 oz each- "B-Complex," 1 b.. MOLD DETOX BOX contains:- QS Pure PC, 2 bottles- QS Liposomal Glutathione, 2&nbs..
Deluxe Detox Qube contains the following products:Item &nb..
1 x 9mg IMD Intestinal Cleanse2 x Clear Way Co-factor(120 count)6 x Etheric Delivery Glutathione (50..